Queen Beatrix of the Netherlands has dismissed as "real nonsense" a domestic political row over her wearing of a headscarf while on a trip to the Gulf. She was reacting to questions in parliament tabled by Geert Wilders's Freedom Party (PVV) which claimed she "legitimises the oppression of women". 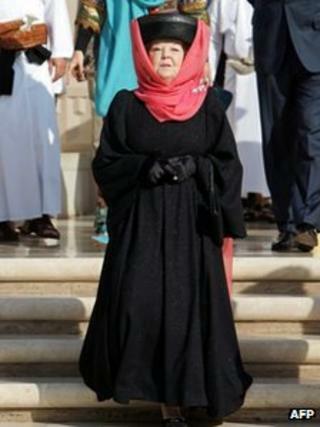 Queen Beatrix wore a gown and headscarf first on Sunday at a mosque in Abu Dhabi and again on Thursday in Oman. Her officials said she had acted out of respect for Islamic tradition. During Thursday's visit to the Sultan Qaboos Grand Mosque in the Omani capital, Muscat, the queen wore a red shawl over her hat while Princess Maxima who was accompanying her also had her head covered. Dutch TV said that by also wearing gloves, the queen had covered herself even more than in Abu Dhabi. The PVV, an anti-Islam party that props up the Dutch minority government without being part of the coalition, described her wearing of a headscarf on Sunday as a "sad spectacle". In a written parliamentary answer, Prime Minister Mark Rutte said that when "Her Majesty visits a house of worship, the dress requirements are respected". Reporters with the royal party in Muscat on Thursday described the queen as heaving a deep sigh, while saying she was not surprised by the row. Princess Maxima also spoke out, according to Dutch media, pointing out that two-thirds of students in Abu Dhabi were women. Although the queen regularly speaks to the Dutch press at the end of a royal tour, her frank remarks about a domestic political party are being seen as unprecedented. The Dutch Labour party responded by suggesting that the monarch's remarks were a slip of the tongue. MP Jeroen Recourt said the comments were politically sensitive and awkward.